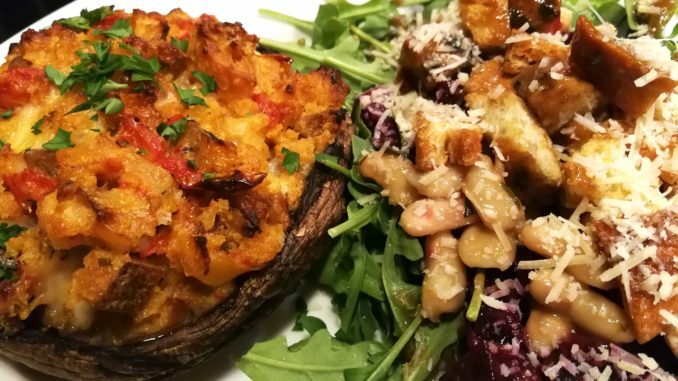 Baked Stuffed Portobello Mushroom Caps. 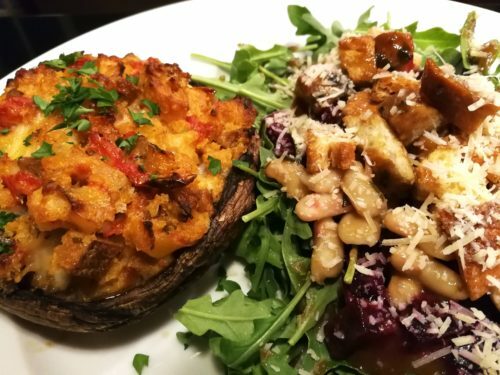 My Baked Stuffed Portobello Mushroom Caps can be served as an appetizer by themselves or as a main course along with a salad or on top of a plate of pasta. 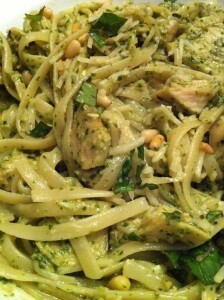 I really like a light lunch or dinner some days and this recipe fits the bill. It’s been a super rainy Spring here in Virginia. I’m sure the plants and trees are loving it. Today is a particularly wet one. We’ve received about 5 inches of rain in the past few days with more rain expected this week. Along with the rain, wild mushrooms have been popping up all over the place in the woods. I’m not an expert in picking edible wild mushrooms so I rely on my local grocery stores and farmers markets. 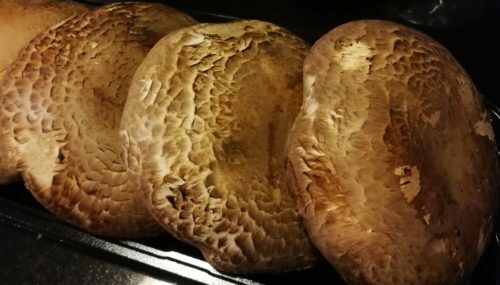 For my Baked Stuffed Portobello Mushroom Caps recipe, use the largest mushroom caps you can find. 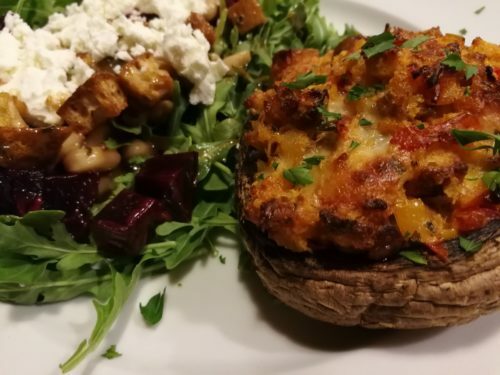 My Baked Stuffed Portobello Mushroom Caps recipe uses Nature’s Promise brand tomato and mozzarella chicken sausage. You can use your favorite Italian-style sausage for this dish. 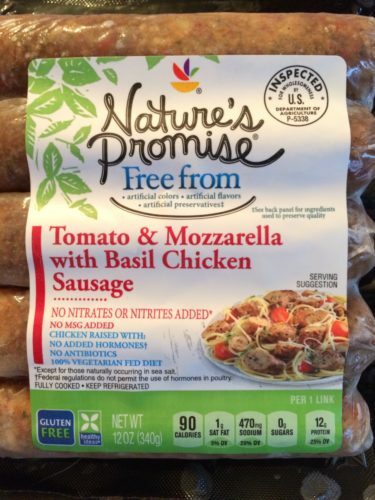 I like the Nature’s Promise products as they are either organic or “free from” undesirable ingredients. 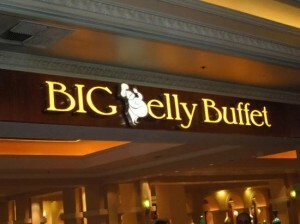 Of course, you could omit the sausage for a vegetarian version. Preheat your oven to 350 degrees Fahrenheit. Remove the gills from some large portobello mushroom caps. Lightly brush the mushroom caps on both sides with olive oil. Grill the portobello mushroom caps gill side down in a grill pan. Flip them after a few minutes and cook just a few minutes more. Don’t overcook them because they will be baked. Set them aside on a foil or parchment lined baking sheet, gill sides up. Finely dice some onion and bell pepper and saute in butter over medium heat until the veggies have softened slightly. 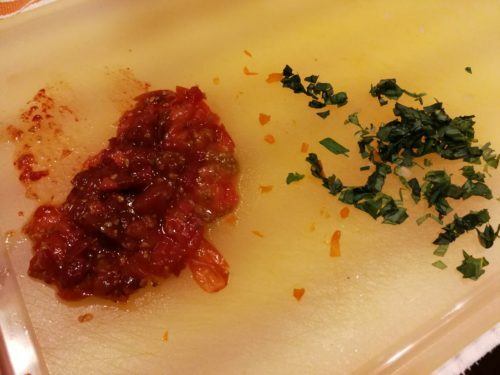 Chop some roasted tomatoes and mince some garlic and add to the onion pepper mixture. Warm through. Finely chop some pre-cooked Italian sausage. Add the sausage and a splash of white wine to the vegetable mixture and cook until the liquid evaporates. Remove the sausage mixture from the heat and set aside to cool. Add some panko breadcrumbs, shredded Parmesan cheese, and finely chopped fresh basil to the sausage mixture. Combine and season with a bit of salt. Sprinkle some crumbled goat cheese on the gill side of the mushroom caps. 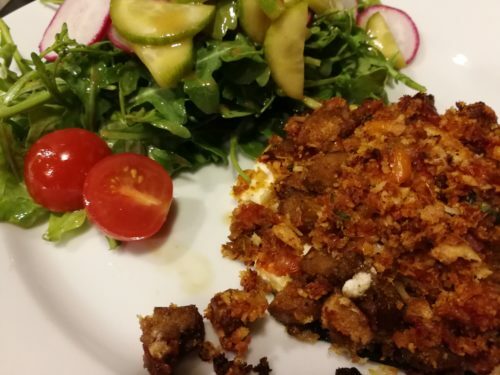 Mound the sausage mixture on top of the goat cheese crumbles. 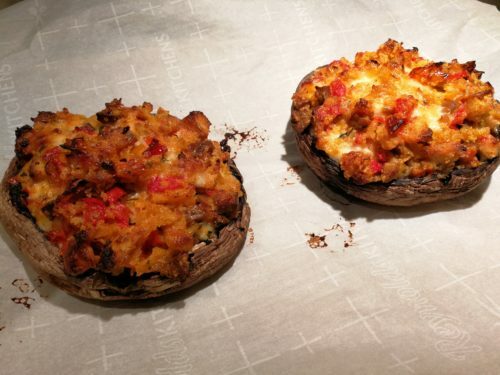 Bake the stuffed mushroom caps for 15 minutes or until the filling has heated through and is golden brown on top. Drizzle some balsamic vinegar syrup on top and garnish with some chopped parsley. Offer with a side salad such as my Roasted Beet and Goat Cheese Salad or a field greens salad with my Dijon Mustard Dressing. Atticus, my dog, totally loves vegetables including mushrooms. He’s a crazy dog that we rescued and has lived with us for going on 5 years now. We love that he likes veggies. He is a meat-lover too, so the sausage in this dish has him paying lots of attention just in case a small bite of sausage drops onto the floor. You can follow Addy on his Facebook page. 2. Lightly oil both sides of the mushroom caps with the 2 teaspoons of olive oil. 3. In a grill pan, lightly cook the mushroom caps, gill side down first. Then turn over and grill the other side. Don’t overcook, just slightly soften the mushroom caps. Remove from pan and set aside, gill sides up, on a parchment paper-lined baking sheet. 4. In a skillet, warm the 2 tablespoons of olive oil or butter. 5. Saute the onion and bell pepper until the vegetables have softened. 6. Add the chopped roasted tomatoes and the garlic and saute for a few minutes. 7. Add the sausage and the white wine and cook until the liquid has evaporated. Set aside to cool. 8. 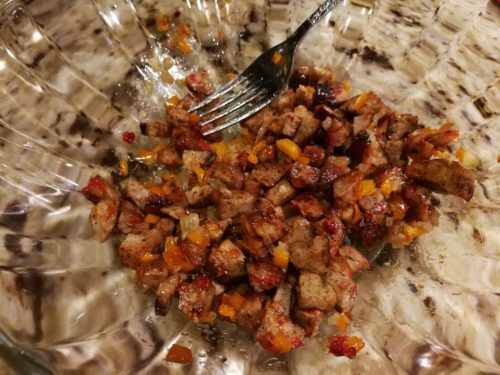 When the vegetable and sausage mixture has cooled, place it in a non-metallic bowl. 9. Add the breadcrumbs, Parmesan cheese, chopped basil, and salt and mix together. 10. Divide the crumbled goat cheese between the mushroom caps. 11. Top the goat cheese with the sausage mixture. 12. Bake the stuffed mushroom caps for 15 minutes or until the sausage mixture has warmed through, the goat cheese has melted, and the tops are slightly browned. You might want to add some more shredded Parmesan and broil the tops before serving. 13. 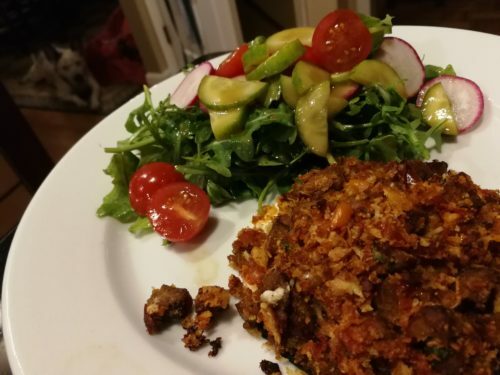 Using a spatula, remove the baked stuffed mushroom caps to serving plates. 14. Drizzle with optional balsamic vinegar syrup, garnish with chopped parsley and serve. Makes two baked stuffed mushroom caps. 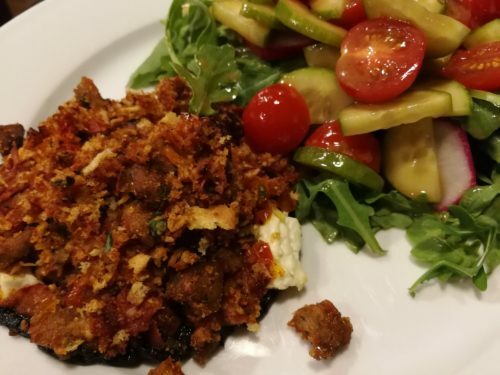 Serve with a side salad or on top of pasta as a main course. Serve alone as an appetizer. Variations: Omit the sausage for a vegetarian version. Use your favorite Italian sausage. Chop some cremini mushrooms to add to the sausage mixture. Use some sauteed fresh sausage instead of the pre-cooked. 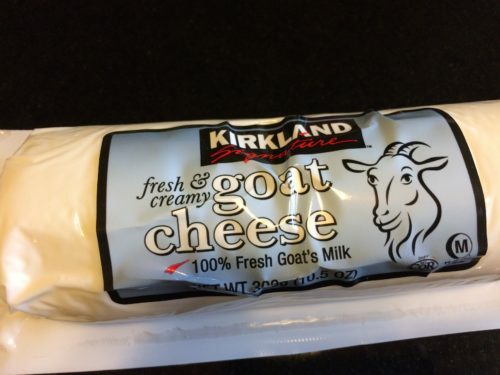 Try some other melty cheeses such as mozzarella or fontina in this dish. You can drizzle some of the balsamic vinegar syrup onto the mushroom caps (gill side) before you add the sausage mixture.